Computational Toxicology: Methods and Applications for Risk Assessment is an essential reference on the translation of computational toxicology data into information that can be used for more informed risk assessment decision-making. 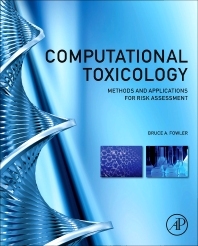 This book is authored by leading international investigators who have real-world experience in relating computational toxicology methods to risk assessment. Key topics of interest include QSAR modeling, chemical mixtures, applications to metabolomic and metabonomic data sets, toxicogenomic analyses, applications to REACH informational strategies and much more. The examples provided in this book are based on cutting-edge technologies and set out to stimulate the further development of this promising field to offer rapid, better and more cost-effective answers to major public health concerns. Toxicologists, pharmacologists, pharmaceutical scientists and biochemists in academic, regulatory and industry (pharmaceutical, chemical, environmental and biotechnology) settings. Dr. Fowler began his scientific career at the National Institute of Environmental Health Sciences prior to becoming Director of the University of Maryland System-wide Program in Toxicology and Professor at the University of Maryland School of Medicine. He then served as Associate Director for Science in the Division of Toxicology and Environmental Medicine at Agency for Toxic Substances and Disease Registry (ATSDR). He is currently a private consultant and Co-owner of Toxicology Risk Assessment Consulting Services (TRACS), LLC. In addition, Dr. Fowler serves as an Adjunct Professor, Emory University Rollins School of Public Health and Presidents Professor of Biomedical Sciences, Center for Alaska Native Health Research (CANHR) at the University of Alaska- Fairbanks. Dr. Fowler, is an internationally recognized expert on the toxicology of metals and has served on a number of State, National and International Committees in his areas of expertise. These include the Maryland Governor’s Council on Toxic Substances (Chair), various National Academy of Sciences / National Research Council Committees, including the 1993 landmark NAS/NRC Report on “Measuring Lead Exposure in Infants Children and Other Sensitive Populations” for which he served as the Committee Chair. He has also served on a number of review committees of the National Institutes of Health, the USEPA Science Advisory Board and the Fulbright Scholarship review committee for Scandinavia (Chair, 2000-2001). In 2016, he became an Inaugural Member of the Fulbright 1946 Society and in 2018 became a member of the Fulbright Association Board of Directors. He has also served as a temporary advisor to the World Health Organization (WHO) and on working groups of the International Agency for Research Against Cancer (IARC) for a number of toxicology and risk assessment issues. He is presently appointed as a member of the Joint FAO/WHO Expert Committee on Food Additives (JECFA) for the period 2016-2020. Dr. Fowler has been honored as a Fellow of the Japanese Society for the Promotion of Science (JSPS), a Fulbright Scholar and Swedish Medical Research Council Visiting Professor at the Karolinska Institute, Stockholm, Sweden and elected as a Fellow of the Academy of Toxicological Sciences. His more recent awards include a CDC/ATSDR, Honor Award for Excellence in Leadership Award 2010, The US Pharmacopea (USP) Toxicology Committee 2010-2015 and the USP Elemental Impurities Panel which received the 2014 U.S. Pharmacopea Award for an Innovative Response to Public Health Challenges (Group Award). He is currently appointed to the USP Nanotechnology Subcommittee 2015-. Dr. Fowler was previously elected to the Council of the Society of Toxicology (2005-2007), the Board of Directors of the Academy of Toxicological Sciences (2006-2009), and more recently, to the Council of the Society for Risk Analysis (2014-2017). He is the Federal Legislative and National Active and Retired Federal Employees Association and (NARFE)-PAC Chair for the Rockville Maryland Chapter of NARFE and is currently Chair of the Federal Legislative Committee for the Maryland NARFE Federation. Dr. Fowler is the Past- President of the Rotary Club of North Bethesda, Maryland (2016-2017) and was selected as Rotarian of the Year in 2015 for his work in developing a taxi-based program to help persons with disabilities gain independence via reliable transportation to work. Dr. Fowler is the author of over 260 research papers and book chapters dealing with molecular mechanisms of metal toxicity, molecular biomarkers for early detection of metal-induced cell injury and application of computational toxicology for risk assessment. He has been the editor, co-editor or author of 10 books or monographs on metal toxicology and mechanisms of chemical – induced cell injury, molecular biomarkers and risk assessment and computational toxicology. Dr. Fowler is currently focused on the global problem of electronic waste (e-waste) in developing countries. He serves on the editorial boards of a number of scientific journals in toxicology and is an Associate Editor of the journal Toxicology and Applied Pharmacology and a past Associate Editor of Environmental Health Perspectives (2007-2016).